Early on in my PT career a common message I would tell runners and other patients was to not let their knee past your toes when they performed squatting exercises. We would be placing too much strain on the knee and should focus more on challenging the hip. Since I work solely with runners and triathletes, I see a lot of knee pain. Whether it’s general soreness after a run or lift, or someone dealing with an actual pathology, I get to talk about the knee a lot. Most of the literature looking at injuries in runners finds knee pain as the most common complaint. This includes patella tendinitis, patella femoral pain syndrome, IT band syndrome, meniscal tears and many other pathologies. When knees are irritable, knee dominant exercises often hurt. This means squatting, lunging and step up variations are often taken off the table as they might further aggravate someone’s symptoms. When we do these types of exercises, and let our knee get past our toes, we will place more strain on all the structures of the knee. Strain is not always bad. 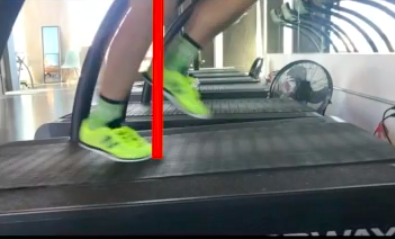 If we critically analysis the requirements of running, the knee has to get past the toes during the running gait cycle. Here is a still shot of running on level ground. Where is the knee? Past the toe. The ability to maintain this position is even more vital as we run uphill. By placing our running surface at an incline, we take up more motion at the ankle, and further stress the knee. The knee needs to be conditioned to manage this position in order to better deal with running. By doing this are we placing more demand on the patella and it’s associated structures? Yes. We have to do this because the knee has to be ready to run. I can’t tell you how many runners I see who hinge (use more hip movement) their squats because some rehab professional told them allowing their knee to come forward was a bad thing. Being able to bend your knee, on one leg, with your knee past your toes is a requirement of running. This is not to say we should not be mindful of how someone is performing a squat, or step down, when dealing with knee pain, but we have to make sure the exercises we are choosing are reflecting the demands of the sport. This position is often painful for runners, so we need to take a progression to that point and then keep the volume low when working through these exercises. This video highlights an easy progression from more hip movement to more knee movement. Besides progressing runners into this type of drill, we should be working on getting the whole leg strong. Muscles don’t work in isolation when we move and this is especially true in running. While many runners could benefit from getting stronger through their glutes, hamstrings and lateral hip, we need to be applying load directly to the knee. Managing pain is never as simple as one variable. When a runner is having an issue we need to check training decisions, recovery, running mechanics and many other factors to make sure we are putting them in the best situation to get better. This includes making sure our exercise interventions match the demand of their sport. Stay up to date on all my videos, blog posts and other social media content!